A distinctive mayfly with a brown body and wings which appear slightly marbled with brown and white. Nymphs of Ecdyonurus torrentis are typically found in riffle areas of rivers and streams. They are usually found clinging to submerged plants and stones, although they may swim if disturbed. There is one generation a year, which usually overwinters as nymphs and emerges between May and September, although in some years adults can be found as early as March. E. torrentis feeds either by scraping periphyton from the substrate or by gathering fine particulate organic detritus from the sediment. 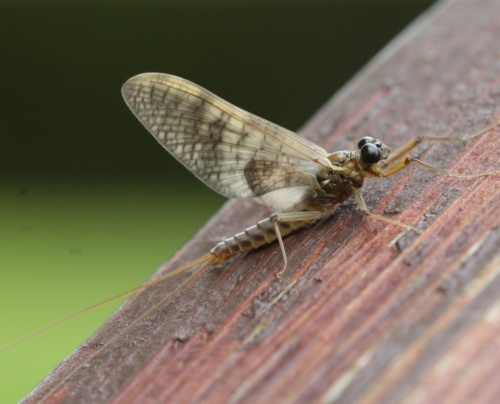 Once mated, the female flies upstream and descends to the surface of the water to release a few eggs by dipping the tip of her abdomen on to the surface at intervals, or by actually settling on the surface for short periods. After several visits to the water the egg supply of up to 8300 eggs is finished and the spent female falls on to the surface. Thought to be widespread in suitable areas throughout Britain.